This is another Wednesday Challenge image from one of the Yahoo Groups I belong to. I printed her on regular copy paper and she is sorta sepia tones but a little more orange looking to me. So I picked this fabulous pumpkin colored paper I got at Hollo's and punched out a Marvy Giga Scalloped Circle in the pumpkin and also one in white. I used my Memory makers Paper Piercer Deluxe to put holes in the edges of the pumpkin one all the way around. I then turned it a bit and mounted it onto the white one. I used my Marvy Mega Circle punch to cut out the girl and mounted her into the center of the scalloped ones. I folded my pumpkin card stock base in half and using my Pallete Noir Ink and my So Splattered TAC set (TA-2621) I applied some off-stamping to the edges all the way around. 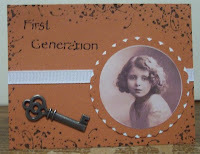 I used some rub-on's for the words "First Generation" that were from Simple Scrapbooks. Then I found a key in my embelly box and added it to the bottom corner. I ran a piece of white ribbon across the card and then mounted the scalloped circle piece onto the ribbon. It is a simple card but I liked how the colors came together.